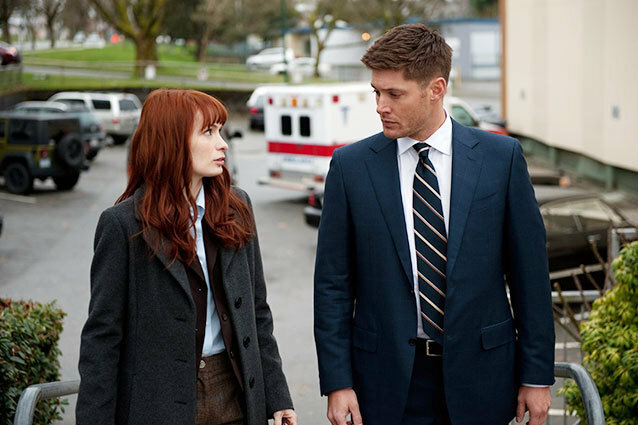 I’ve got to be honest with you: when I first saw the promos for Wednesday night’s Supernatural, featuring the return of Felicia Day as hacker extraordinaire Charlie in a die-in-the-game-die-in-real-life kind of story, I thought the central storyline of closing the gates of hell was going to be put on pause for another week. While I expected a fun, quirky break from the heavy plot that’s been steering this season so far, I was a little bummed that we weren’t going to dive deeper into the main issues plaguing our favorite hunters this year. But I could not have been more wrong. Sure, Charlie was back in all her geeky splendor, but in her third episode we finally got to know the real human behind the hacker with multiple fake identities. We learned her history, the sad and heartbreaking motivation behind her hacker ways, and the growth that will propel her forward into happier days (hopefully). And her presence also buoyed Dean and Sam into a hug that I’m not proud to say I paused and rewound more than I should have. But hey, when Winchesters hug, you cherish that moment! Cherish it! What brought our favorite (still living) female on Supernatural back to Sam and Dean in their Men of Letters bunker? Charlie decided after her two brushes with the evil lurking out in the real world that she needed to learn how to be a hunter like the Winchesters. She found Carver Edlund/Chuck(/God? )’s book series/gospels about the Winchesters’ past, read up on all their history and hunting ways, found a case near where Sam and Dean’s cell phone signals were, and met up with them. Seems like a new kind of Djinn – one that fed on fear – was turning people into jelly, and with Sam feeling under the weather thanks to the trials taking a physical toll on him, Dean teamed up with Charlie to take the Djinn down. Yeah, you read that right: Dean and Sam were finally being honest and dealing with Sam’s physical issues in a mature way. Look how far these boys have come! I mean, sure, Sam didn’t exactly stay out of the hunting game for long, but at least they are both acknowledging that not everything is okay with Sam at the moment. When Charlie stopped answering her phone, however, Sam and Dean knew something had to be wrong. They tracked her signal to a random apartment where they proceeded to find all of her fake passports and ID’s, and they realized they’d found Charlie’s real home. They followed some information to a coma patient in the hospital, and here’s where it got real: turns out, Charlie’s mom was the coma patient. Charlie was at a sleepover when she was 12, got scared, and called her parents to ask them to come pick her up. On the way to get her, a drunk driver hit their car and Charlie’s father died and her mother has been in a coma ever since. Charlie pays for all her medical bills, hoping against reason that she will wake up one day. Charlie blames herself for what happened. When Dean realized this, he got into super-protective brother mode, found where the Djinn had captured Charlie, and both he and Sam killed the two Djinns. Unfortunately, Charlie was still stuck in her Djinn-induced fear dream, so Dean took some African dream root and joined her to help get her out. He convinced her to let go of her unrealistic hope that her mom would wake up so she could apologize and to stop blaming herself for what happened. Once she did that, they were able to escape the dream and make their way back to Sam. Even though Charlie said goodbye to her mom in the dream, she still had to say a proper goodbye in reality. She went to her mother’s hospital room one last time, and read The Hobbit to her one last time (it was her childhood favorite). Such a bittersweet moment, but it was honest and necessary to make Charlie a real human being and less of a caricature. Charlie and Dean’s goodbye scene was all-too perfect, and her situation reminded Dean once more how much his brother means to him. Instead of hounding Sam for not listening to him about taking it easy, Dean just went inside the Men of Letters bunker and hugged him. And with that one gesture, tears were streaming down my face. Damn you, Winchester brothers: you always know just the right way to make me cry! — So, not a quote, but I was overjoyed when Charlie’s theme song, “Walking on Sunshine,” made an appearance! Dean wasn’t having it, thought, and angrily shut it off when Charlie was trying to have a montage of trying on clothes. Come on Dean, everyone knows you have to have a good montage scene! ‘Supernatural’ Recap: What’s Wrong with Castiel?